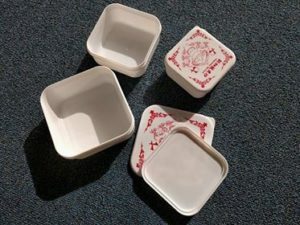 Today, Sam, a 15-month old boy, discovered a set of three Chinese nesting boxes. After opening the boxes, he was struggling with closing the lids. Meanwhile, Susie, a 24-month old girl, was observing Sam’s play with curiosity. After some time, she took one of the boxes away from Sam’s hands. Sam protested and followed Susie who was quickly navigating around the room. Sam burst into tears but continued to follow Susie. A parent narrated, “Sam is crying. He wants the box.” The parent looked at me with the silent question, “Can we do anything else to help?” Sam walked over to his mom for comforting and observed the situation from his mom’s lap. Eventually, Susie put down the box and seemed to have moved on. When Sam noticed that the box was no longer in Susie’s hands, he decided to search for it. Susie noticed that Sam was looking for the box, so she quickly picked it up again. After trying to get the box from Susie, Sam cried and returned to his mom for comforting. In the third attempt, Susie placed the box on the floor not far from Sam. This time, Sam chose to stay on mom’s lap. I quietly suggested to Susie, “You can pick up the box and take it to Sam if you want.” Susie picked up the box and gently placed it into Sam’s hands. Then she looked at Sam and Sam’s mom carefully studied their emotions. Susie turned around, found the lid from the box and brought it to Sam. Sam stopped crying. It was a great learning opportunity for Susie and Sam, as well as the other children and parents. If we had forced Susie to share and if he had tried to protect Sam, we would have missed this learning opportunity.